Are you looking for specials on wrinkle-smoothing products from Allergan? Join our email list, and join Brilliant Distinctions™. Both are 100% FREE and will help you get the treatments you want as cost-efficiently as possible. How Do I Register for Brilliant Distinctions™? Brilliant Distinctions™ is a loyalty program where patients earn discounts on every purchase of BOTOX®, Juvéderm® XC, Juvéderm Voluma® XC, Latisse®, and SkinMedica® products. The points can then be redeemed for discounts on future purchases or treatments. 2) Enter your information and birthday, and choose a username and password. As a Brilliant Distinctions™ member, you will receive personalized monthly emails that include information about your account, articles, special offers, and details about events in your area. If you are having problems using the Brilliant Distinctions™ Program website, just call 1-888-324-2745 (9AM–8PM, EST M–F) and someone will help you. How Can I Start Earning Points Once I’m Registered? Provided you have registered successfully online, you will earn points every time you get BOTOX®, Juvéderm®, or Latisse® or purchase SkinMedica® products. When you come in for an appointment or to purchase products, simply remind us that you are a Brilliant Distinctions™ member so we can enter your treatment information into the program. Afterward, you will automatically receive an email with your updated points. Note: BOTOX® Cosmetic treatments must be at least three months apart for points to be deposited into your account. How Do I Redeem Points for a Coupon? 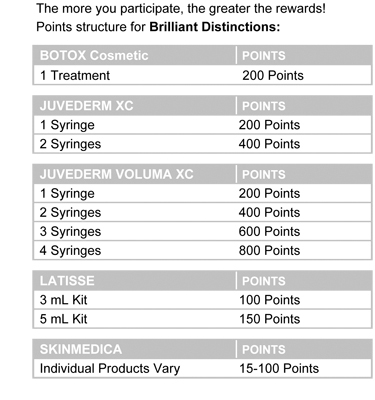 1) Log on at BrilliantDistinctionsProgram.com and go to “Redeem Points” to get dollars off select Allergan products and services. 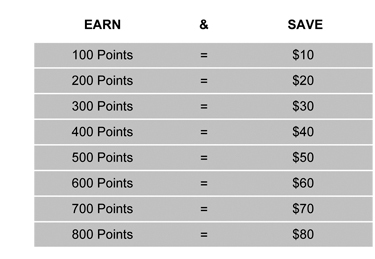 You will see a drop-down menu that will show available coupon amounts based on how many points you have accumulated. 3) Click “Create Coupon,” and a printable coupon will be available for you to bring to your physician at your next visit. Coupons can be created for a maximum dollar amount of $80. Important Note: Once a coupon is created, it will expire in 60 days. If your treatment plans have changed and you will not be using your coupon before the expiration date, call the Brilliant Distinctions™ call center (1-888-324-2745, 9AM–8PM EST, M-F) and have the points redeposited. They will be waiting for you to use them at another time. I Forgot to Print My Coupon—What Now? Since this program is not maintained by our office, but rather by Allergan, we cannot honor any discounts unless a printed coupon is presented at the time of treatment. We do not have the authority to make exceptions since it is not our program. You are always welcome to call the Brilliant Distinctions™ call center (1-888-324-2745, 9AM–8PM EST, M–F) and have the points redeposited. Do the Points That I’ve Earned Ever Expire? Once your points are deposited, they are good for one year. 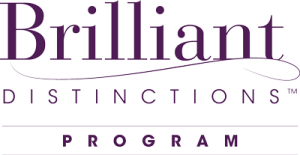 Our office cannot make allowances for expired vouchers or points since the Brilliant Distinctions™ Program is an Allergan program.